Can any mobile work with mHITs? Do I need a credit card to use? Is there a daily transaction limit? 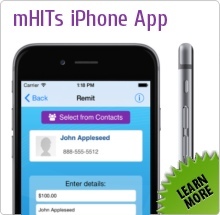 Send money overseas instantly from your mHITs account. New mHITs iPhone app available. mHITs WINNER in Australian Export Awards. mHITs Remit is now… Rocket Remit! Hi, We’ve officially changed our name from mHITs Remit to Rocket Remit. We’ve put in a lot of work to provide to you with a fantastic new responsive website with lots of new features. But don’t worry, we’re still providing the same personalized service incase you need further assistance ;). Enjoy the fast transfer and Let’s ROCKET!!! TAKE ME TO ROCKET REMIT! !